Welcome to The Grateful Grazer! For my first post, I want to share a super easy dessert/snack that’s perfect for Valentine’s Day. 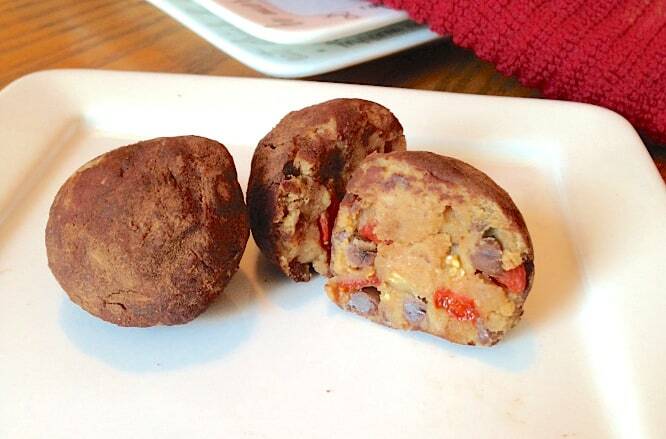 These Goji Berry Cookie Dough Truffles are delicious and full of nutrition. This isn’t your typical cookie dough truffle, friends. Chickpeas (aka garbanzo beans) make up the base for these bites and provide healthy fiber and plant-based protein. These truffles also contain goji berries, also known as wolfberries. Goji berries are often considered a superfood now and have been used for centuries in Traditional Chinese Medicine. Goji berries are thought to support the liver and kidney, strengthen the body, and prolong life. More recent research has led to a deeper understanding of this antioxidant powerhouse. Goji berries are the best natural source of the beneficial phytonutrient, zeaxanthin and they’re also rich in vitamin C. Both zeaxanthin and vitamin C prevent cellular damage by acting as antioxidants. Studies have also found that the goji berry may help boost the immune system, improve insulin sensitivity, and lower blood pressure. You could substitute any dried fruit for the goji berries but I definitely recommend giving them a try like this! The goji berries add just the right amount of tart fruitiness to this sweet bite. And if you’re in need of a quick Valentine’s Day gift, these fancy little truffles would be the perfect little treat. These healthy Valentine's Day treats require no baking and are filled with delicious flavors thanks to chocolate chips and goji berries. In a food processor, add chickpeas, maple syrup, almond butter, baking soda, vanilla, and salt. Pulse until the mixture is well combined and creamy. Transfer the mixture to a large mixing bowl. Stir in chocolate chips and goji berries. Place dough in freezer for 30 minutes. After 30 minutes, remove and form into tablespoon-sized balls with hands. Roll in cocoa powder until coated. Store in freezer until ready to serve. Have you ever tried goji berries? What’s your favorite way to eat them? P.S. If you’re looking for another delicious goji berry recipe, try these Toasted Coconut SunGold Kiwifruit Cups. Using chickpeas — what a great idea! Do you now how subbing honey for the agave nectar would effect the nutritional values? That’s so awesome, thanks for sharing! I love shocking people with how delicious healthy food can be! 😉 Using pomegranate is a great idea. Any dried fruit should work, endless options!